For its eleventh original creation, Cirque Éloize invites you to enjoy an exuberant music own Saloon. 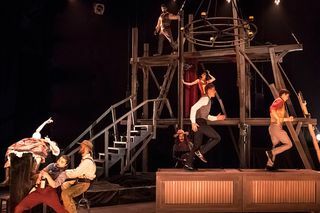 Featuring a mix of well-known songs and original numbers, this production blends the euphoric energy and live folk music of classic Old West saloons with cutting theatre. Discover Cirque Éloize’s unique genre-defying version of this legendary setting. Positioned at the heart of the renewal of circus arts, Cirque Éloize has been creating moving performances filled with magic and emotion since 1993. Always focused on the renewal of artistic self expression and acrobatic excellence, the organization ranks among the world’s leading contemporary circuses. Cirque Éloize expresses its innovative nature through theatricality and humanity, by blending circus arts with music, dance and theatre, in a path-breaking manner. Cirque Eloize Saloon is not available to book, please sign up to our newsletter for updates and offers on forthcoming and available shows. Where is Cirque Eloize Saloon?